Classically showcase two generous hanging adornments from your wall or a post using these Achla Designs Black Wrought Iron Scroll Brackets. These two sturdy brackets bring an elegant look to your setting, while their bevy of curves captures the eye. The center arm of each arches and culminates in an inward curl, while the rods flanking them curve in an opposite way for beautiful contrast. Attach the back plate of each bracket to a wall or post using the included hardware, and place your hanging adornment on them for a beautiful display. Their black finish remains both durable and lovely, while their wrought iron construction holds a bird feeder or flower basket with ease. Enhance the beauty of two hanging items by placing them on these Black Wrought Iron Scroll Brackets. 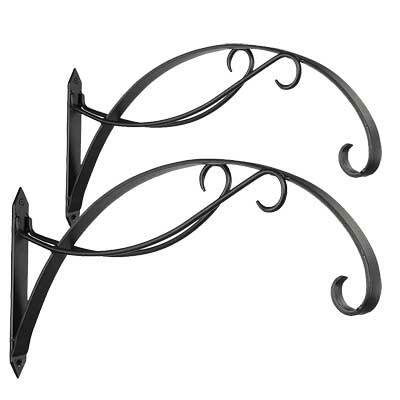 Note: This case pack contains 2 of the Achla Designs Wrought Iron Scroll Brackets, Black, 23" each. Achla Designs Wrought Iron Scroll Bracket, Black, 23"
Achla Fireplace Crane, Black, 24"